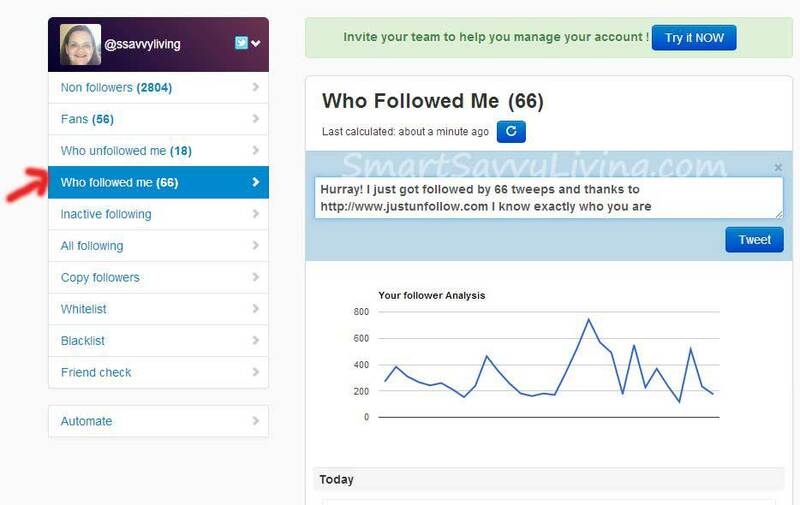 Do you know how to use JustUnfollow to gain more quality Twitter followers? I’ve been using it for just over a month and am thrilled with the results! Last week I wrote about how I set my mind to learn how to use Twitter and ended up doubling my following to over 16,000 in one month. A week later and I’m already up to almost 20,000! At the end of the post I mentioned that I am using JustUnfollow to make the task of finding quality Twitter followers the legitimate way a lot easier, so this week I wanted to go into a bit of detail of how I use it. 1. Go to JustUnfollow.com and sign in with Twitter. You can use the free version to try it out, but to really see the true possibilities I recommend paying the $9.99 and trying it for the month (click on more in the upper right corner and go to settings). It’s a business expense you can include at tax time and from the follower and traffic increase I’ve seen, is totally worth it. With the free version you’re limited to 50 (25 as of 10/2013) follows and unfollows a day while with the paid version you’ll be able to use the site to meet the daily Twitter limit of 1,000 new follows. Note: If you have a brand new account, I wouldn’t follow more than 200 new people a day. For SSL’s already established account, I had no issues starting immediately at the 1k cap a day, however on a brand new account, I did get accused of possible spamming but have since been fine at following around 50-100 new people a day. 2. Weed through your non followers. Click on the first menu item on the left, non followers. Take the time to go through the list and unfollow anyone on the list that you don’t really care about following, such as a blogger you followed when you thought they’d follow you back. Whitelist anyone that you want to continue following even if they don’t follow you, like a news company. White listing means that you will continue following that person/brand, but they will no longer show up in your list of non followers. Unfollowing those that aren’t mutually beneficial will free up the limit on how many more people you can follow. See my Twitter follower guide from last week for more info about the limits. 4. Copy followers for those in similar niches as yours. Click on the 7th menu item on the left, Copy followers. If you are a food blogger, you’ll want to follow the followers of other food bloggers. The same goes for DIY, lifestyle, mom blogs, etc. These can be bloggers you already network with, blogs you follow, or looking for new to you blogs that are popular by searching. Again, blacklist anyone you don’t want to follow and try to reach your 1,000 daily cap each day. 5. Come back any day that you have time and take the time to repeat the above. Make sure you start by clicking on the refresh icon for up-to-date stats. I start with unfollowing those that have unfollowed me, and unfollowing 100+ of those that haven’t followed me back. I try to not unfollow too many at a time in case they end up following me back later, but I will unfollow more if I hit Twitter’s limit based on how many followers I have. I then follow back those that have followed me and use the rest of my daily limit using the copy follower function. You can also setup JustUnfollow to auto follow back those that follow you, but I don’t recommend it because you may end up following people you don’t actually want to follow. You can also auto DM those that follow you, but I don’t like doing this because honestly it’s annoying and spammy to receive all those DMs. This is pretty much the extent that I use JustUnfollow. One handy feature that I may explore more in the future is to also unfollow those users that aren’t currently very active, but as of now I haven’t needed to. 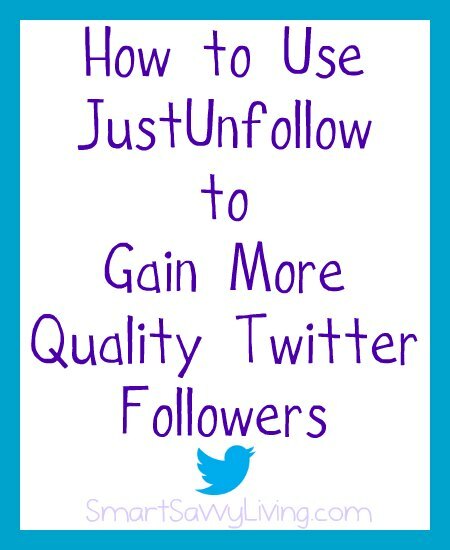 Be sure to check out our other blogging posts if you enjoyed this post on How to Use JustUnfollow to Gain More Quality Twitter Followers! Thank you! I wasn’t quite sure how to use this to its fullest potential. I’m still going with the free version for now but I like to “clean house” about once a week! I’ll add you because you have been so helpful. Seems like most Twitter advice is just plain confusing! ;) Keep it coming!! Great article! Thank you for the help! I just found justunfollow today and i’m excited to get twitter to shape up! I shared this article as well on our FB page! Thanks for this post. I’ve started using justunfollow, as I was using manageflitter, which allowed you to quickly follow and unfollow huge batches of people. Twitter shut that down, but I don’t think they’ll do the same with justunfollow because it makes you be a bit more selective. FYI the free version is down to 25 a day. I’m glad you found it useful, Greg. I’ve read about some Twitter sites like that being shutdown lately. I am hoping that JustUnfollow won’t since it’s not really automated. I have been using JustUnfollow for about a week and it’s amazing. The only thing you have to be careful about is getting too crazy with the follows and unfollows. I am still new to Twitter so I didn’t know they monitored people that F/UF crazily, and I ended up getting suspended. I guess that’s fine – there was one day where I followed about 1000 people lol! Thankfully the suspension was more like a warning – all I had to do was type in some CAPTCHA code and agreed that I wouldn’t abuse the system again. Just a fair warning ;). 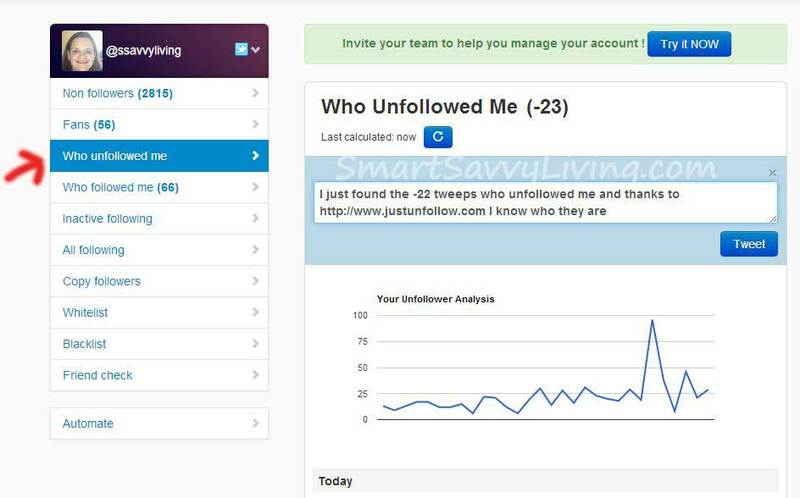 It’s a great system and it makes knowing who followed you/unfollowed you so much easier. I recommend F/UF a maximum of 200 people a day so you don’t get suspended like I did. I actually had that recently happen with a brand new account as well and forgot to update this post with that information. I think I too followed about 1000 the first day and got the same warning. For now I’m sticking to following around 50 – 100 new people a day. Thanks for your feedback and I hope it continues to work well for you!